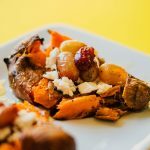 Boiled, smashed, then baked, this smashed sweet potato is crispy on the outside, tender on the inside, and packed with flavor. Bring a large pot of water to a boil then add sweet potatoes (skin intact). Boil for about 25 minutes, or until fork tender. Place potatoes on a well-greased or parchment paper-lined baking sheet and cut three or so shallow slits in the tops of each. With the flat edge of a chef’s knife (or a spatula, anything flat! ), gently smash each sweet potato. Drizzle or brush each with 1 to 2 Tbsp of olive oil and sprinkle with a pinch of salt, pepper, and thyme leaves. Set aside. Place grapes on a greased or parchment paper-lined rimmed baking sheet and drizzle with 1 to 2 Tbsp of olive oil and a sprinkle of salt and pepper. Bake potatoes on upper rack for 20 to 25 minutes, until edges begin to brown and crisp. Bake grapes on bottom rack for about 15 minutes, jostling the pan occasionally, until skins begin to blister. When potatoes and grapes are nice and roasted, assemble! Top each potato with goat cheese, a drizzle of honey, a spoonful of roasted grapes, and thyme. Recipe from Live Eat Learn at https://www.liveeatlearn.com/sweet-potato-smashers-with-roasted-grapes/.